Parrots in the Nyonge holding pen. 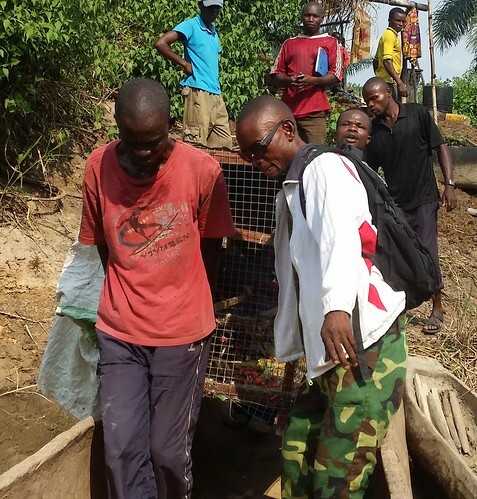 On May 28th 65 parrots were confiscated approximately 10 km north of Kindu in Nyonge, a small village on the edge of the Congo River in Maniema Province. These birds were collected from the wild in defiance of a law that was repeatedly communicated to the public and had already been enforced several times. Obviously the demand is high and the rewards are worth the risk. 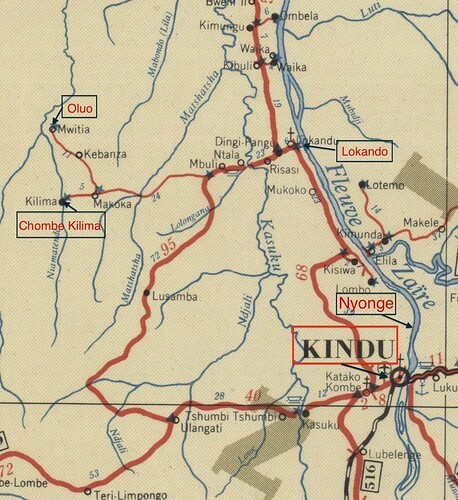 Old map (when Congo was Zaire) showing the approximate location of Nyonge and some of the other villages we write about in the buffer zone of Lomami Park. 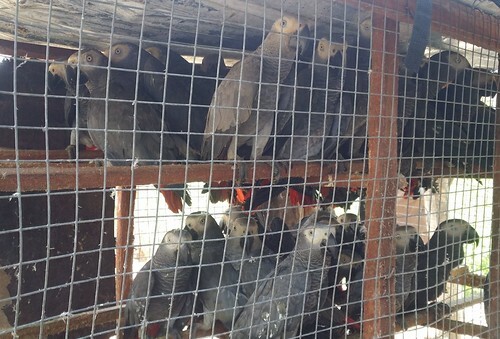 CITES (Convention on International Trade in Endangered Species) : In January 2016 at its 65th the decision of the standing committee was a recommendation that adhering countries “suspend commercial trade “ of African Grey Parrot from the Democratic Republic of Congo. The Pen was discovered but the caretakers came to feed them once a day and disappeared afterwards. They have still not yet been caught. 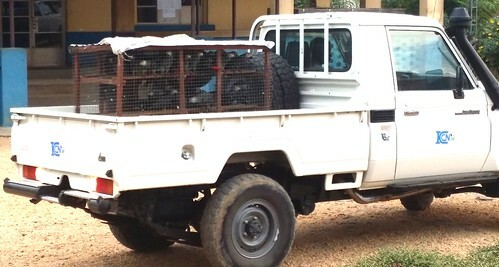 Maniema Province: The governor, recognizing that Maniema was an important hub for the illegal trade, prolonged the annual closed capture season in February 2016. He declared all commerce of grey parrots in the Province illegal indefinitely. Kindu, capital of Maniema province: In February over 400 parrots, destined for Byart Birds, taken in a single bust. The parrots were confiscated and taken to Kindu by dugout. Kisangani reports over a thousand parrots shipped downstream from Maniema on the Congo River during the month of march. The airport in Kindu is closed to parrot transport, not so in Kisangani. In Kindu the minister of the environment received the parrots. 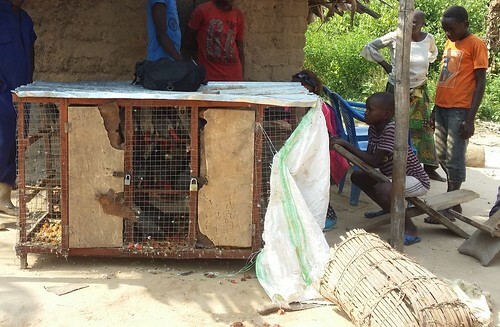 In March and April the Environmental Ministry in Maniema, supported by World Parrot Trust, undertook a major campaign on the radio to publicize the illegality of parrot captures. It also sent delegations to major collecting points. Captured birds were again confiscated. The parrots were transferred to ICCN, the parks institute, for care and release. Parrot holding pens are empty in Kindu. Parrot crates no longer pass through the airport. But less than 10 km downriver a holding pen is discovered. How many more are hidden along the banks of the Congo River? A barge heading towards Ubundu and Kisangani will be hailed; the birds put on board. Many will die, but the profit is still worth it. What does it take to discourage this trade? Is it even possible as long as the markets exist and the price is high? 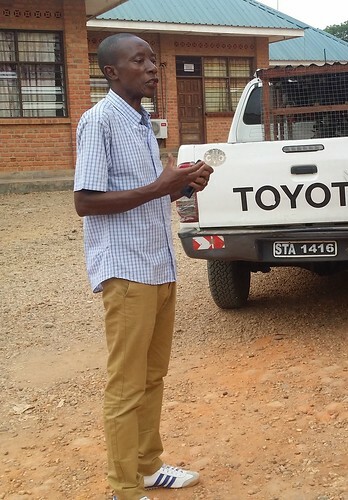 Maniema won’t give up, BUT will it be enough? If an international band won’t close markets – what will? This entry was written by Terese Hart, posted on 2016-05-30 at 7:57 am, filed under Kindu. Bookmark the permalink. Follow any comments here with the RSS feed for this post. Trackbacks are closed, but you can post a comment. Ce travail abattu semblables ne pas avoir d’empleur aujourd’hui mais vous devez en etre fier et les generations future vous diront Felicitation.